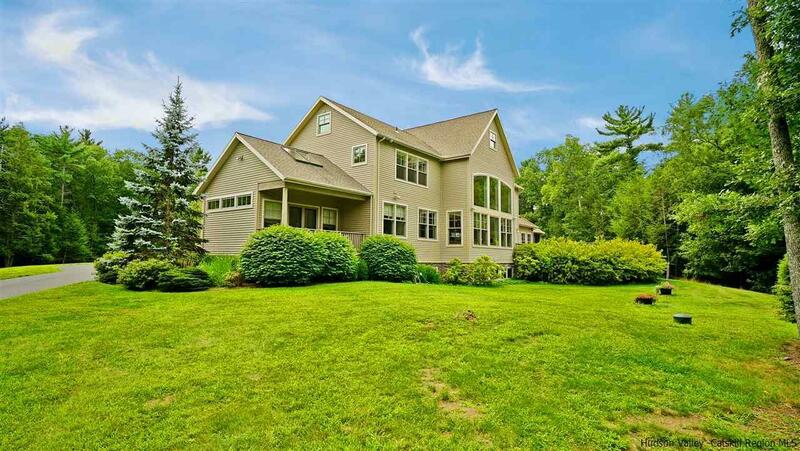 Architect designed and custom-built with views of Woodstock's beloved Overlook Mountain. Located within ten minutes of Saugerties or Woodstock, enjoy this totally private light-filled retreat hidden behind its gated entry in an area of upscale homes. The double height window in the living room draws your gaze toward the mountain beyond, and a totally open flow creates a very calm and "easy" feeling as you travel through each space. Clear sight lines from the dramatic living room through to the dining area, kitchen, great room with stone fireplace, and screened-in porch. All season entertainment areas both inside and out. The first floor Master Suite with high ceilings and romantic deck takes advantage of the view as well and is complete with a well designed walk in closet and luxurious double shower with steam. Upstairs are three additional bedrooms. One of them, a lovely en suite with "air bubble" soaking tub and separate shower, is separated from the other two bedrooms which share a bath between them. This is an extremely well thought out plan which has been exquisitely engineered and maintained. The grounds offer something for everyone- beautifully established perennial gardens with sitting areas, a huge wraparound deck for BBQ's and cocktails, and 20+ acres of woods to explore complete with hiking or cross country skiing trails. A full two acres are fenced in from the deer and make the yard safer for pets and small children, and there are plenty of options for a pool and tennis court. Storage galore everywhere including a 3 car heated garage with lift to accommodate a 4th car, plus two outbuildings and an additional 800+ sq feet of very nicely finished basement area, currently housing a large home gym and storage rooms are not included in the above sq footage. There is roughed in plumbing as well should one want to add a fourth bathroom. Enjoy this immaculately kept, well loved home and make it yours.